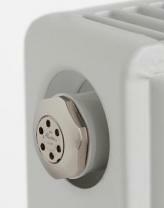 The Aladdin Auto Vent is a product designed to automate the bleeding of radiators. Over time air can build up in a central heating system which results in the tops of radiators feeling cool when the bottom is very hot. This increases the energy required to power the central heating, increases the speed of corrosion inside the radiators, and can make the system noisy in operation. Using a radiator key it is possible to bleed the radiators of this air, but most people do not bother doing this messy (particularly when done incorrectly!) and easy to forget task. 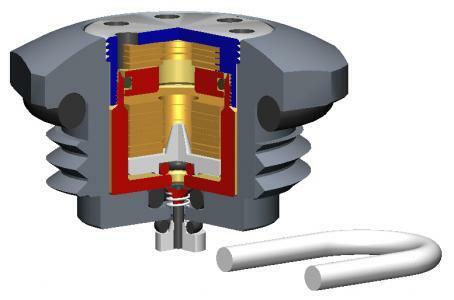 Standard HV30 for standard 1/2″ BSP thread (pictured above and below). and Micro for use with roll-top, designer, and cast iron radiators with 5mm, 6mm, 7mm, 1/8″, and 1/4″ BSP thread. The Auto Vent should be fitted on the hot side of the radiator which is the coolest at the top. This should vent the whole system – i.e. there is no need to fit an Auto Vent to every radiator in the system. Only an adjustable spanner is required for installation which requries no great DIY skills. The Auto Vent valve will last 3-5 years before its cartridge will need replacing. At this stage the radiator will start to collect air again, but the Auto Vent will not start to leak. Replacing the cartridge should take “less than one minute“. Both the HV30 and micro Auto Vent are available for around £10. Click here to visit the official Aladdin Auto Vent website for more information about Aladdin Auto Vents and other products.